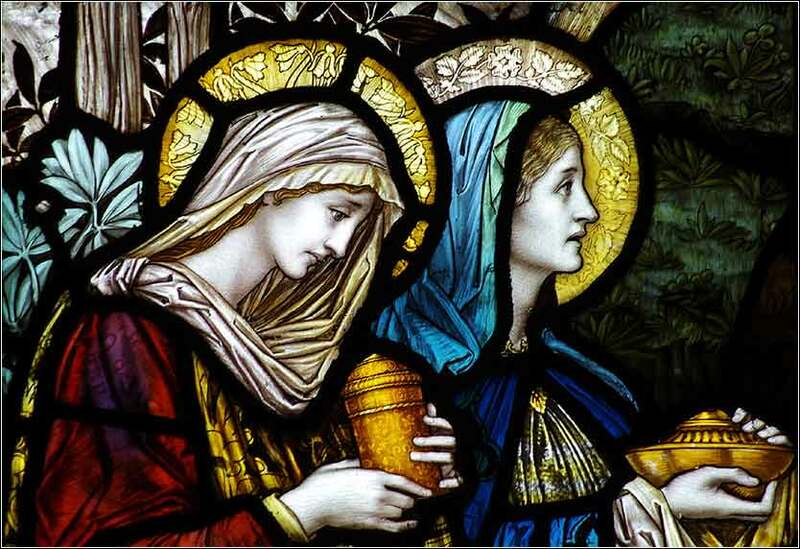 Mary Magdalene and Mary, Mother of Jesus, bringing spices to Christ’s tomb. This gorgeous Victorian stained glass (ca. 1899) was created by J.W. Brown as part of the restoration of 13th-century St. Mary’s Church, Matching, Essex. Saturday is Oldies day on Daily Prayer, and this rendition of Hush by the Dixieaires is one of the great recordings of the day. 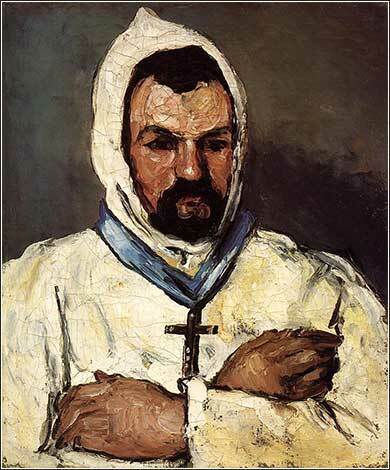 Portrait of Uncle Dominique by Paul Cezanne, ca 1866. However, I consider my life worth nothing to me; my only aim is to finish the race and complete the task the Lord Jesus has given me — the task of testifying to the good news of God’s grace. When the people heard these distressing words, they began to mourn and no one put on any ornaments. For the Lord had said to Moses, “Tell the Israelites, ‘You are a stiff-necked people. If I were to go with you even for a moment, I might destroy you. Now take off your ornaments and I will decide what to do with you.’” So the Israelites stripped off their ornaments at Mount Horeb. “Stiff-necked” is a common term in the Old Testament, meaning stubborn, headstrong, and unwilling to learn. It sounds quaint to us, but the idiom make good sense 3000 years ago, among an agricultural people, when oxen were used to plow fields. An ox harnessed to a plow is steered, as today, with reins. If the ox decides he does not want to turn when the reins are pulled, he stiffens his powerful neck against them. The modern idiom, “headstrong,” has a similar origin. God has been trying for many months to teach the Hebrews His ways, the ways to salvation, but they pull against His reins. God is trying to steer the Hebrews along the path of righteousness, but like headstrong oxen, they stiffen their necks and go their own way, veering off the path and into sin. Throughout this passage and all of Exodus runs a depiction of God existing in a specific place, which is foreign to many Christians' concept of Him. We conceive of God as omnipresent, although we also might say we feel God's presence more strongly at one time than another. But in Exodus, drawing close to God is a physical act. There is an unusual theological issue raised by Yahweh — God the Father — appearing in a physical location. How closely a person may approach His location depends on the person's righteousness. It meant death for most of the Hebrews merely to set foot on Mount Sinai, when God was in residence. Seventy elders were allowed part-way up the mountain, and Joshua went nearly to the top; but only Moses has been allowed in God's presence, and even Moses cannot look upon the face of God. (More on this in the next verses.) The most righteous of people cannot be fully in God's presence, for all men sin and fall short of the glory of God; and too see God while one is tainted by sin means death. Our modern concept of God, often lapsing into a nearly sentimental preoccupation with love, hides part of God's nature from us. We are blinded by Christ's love for us. People conceive of God as wrathful and destructive in the Old Testament, gentle and loving in the New. People speak of a “God of the Old Testament” as though He went on a self-improvement program, or bettered Himself with anger management: but the nature of God has never changed. God loves us, but He is holy, and will eventually and inevitably destroy that which is not.